clarifications are welcome in the comments section. 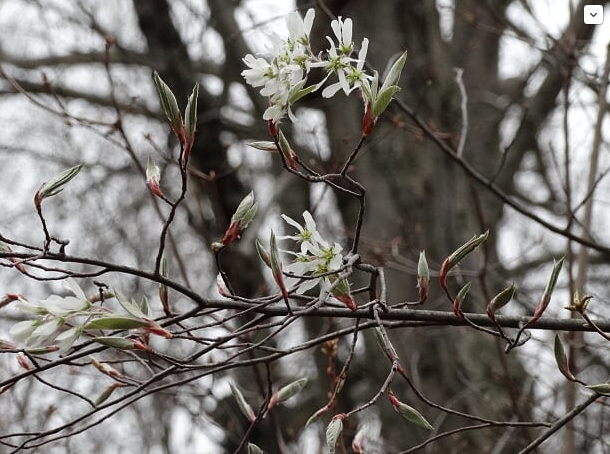 The fact that we noticed the Common Shadbush Amelanchier arborea so early on (compared to the past two years) makes me think that we’re not always in the habit of looking upwards to see the fully blooming white floral branches. I’m not that surprised, though, because the Trillium patch right below it is a definite attention-grabber, and I can't ever remember looking up at that point on the path. We actually saw it on the way out, with its white floral branches soaring above some lower shrubs. But maybe it's taller this year. In any case, Mary says the Shadbush is not a consistent bloomer. 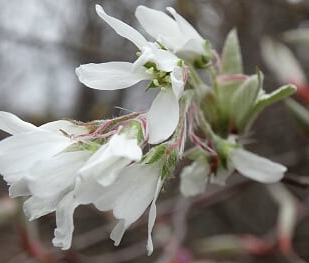 Note: the Common Shadbush has longer petals than the Canadian Shadbush Amelanchier canadensis,;which are only 7-10 mm long as opposed to what we have in the pictures, each 15 mm long. 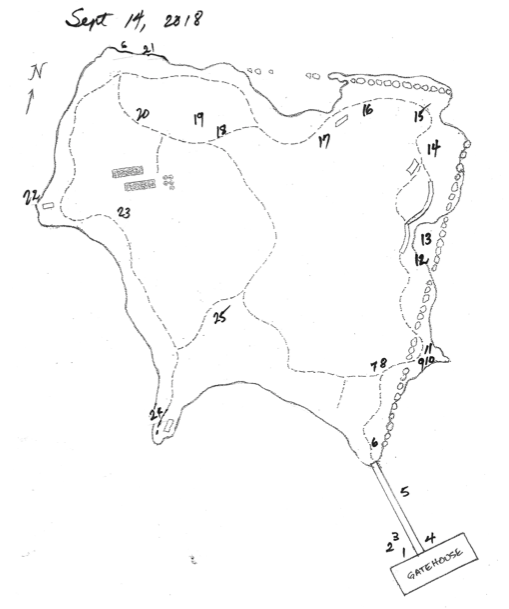 There’s a very small yellow violet that cannot be studied from the path, but first time we’ve seen it on the island. 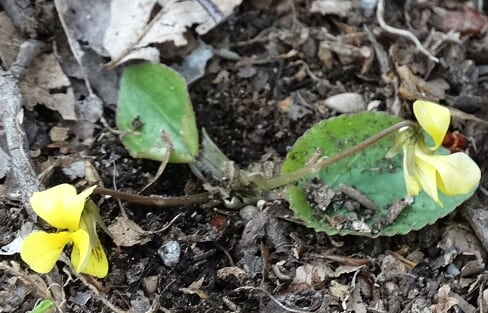 I believe it is a Round-leaved Yellow Violet Viola rotundifolia, which Peterson says is the only stemless yellow violet in our area, as well as being very small with roundish leaves close the ground. Out in The Woods today were single appearances of two kinds of Viola sororia, the regular Common Blue and a Confederate (V. sororia fan priceana). There are some nice pictures and descriptions of this latter variety here). Some clarification about a couple of botanical words I’d like to pass on. 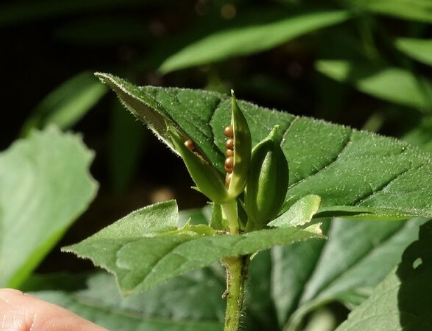 The one we’ve seen a lot of is “var.” (obviously, variety), which according to a BBC gardening website is used to identify a plant that has a “slightly different natural botanical structure” from the rest of the species. The abbreviation “f.” stands for “form,” which they say is used when the plant has “a minor difference to the species, such as leaf colour, flower colour or fruit.” And the “f.” is sometimes left out, so you’ll see, for example, Rosa rugosa f. alba or Rosa rugosa alba interchangeably. 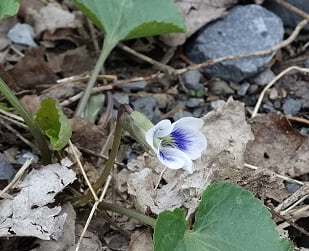 I have looked all over for the meaning of the word “fan,” in Viola sororia fan priceana, but it’s got to be something along these variety/form lines, because alternate names for this variety of the Common Blue are: Viola sororia priceana, Viola sororia var. priceana, and Viola sororia fo. 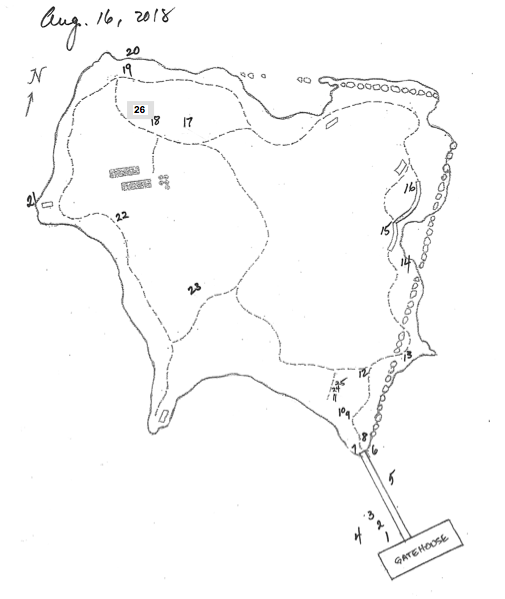 priceana. A reminder more to myself than anyone else, the mostly 6, but sometimes 8-10 “petals” of the Rue-anemone are really sepals. Apparently, Lesser Celandine will be removed from the island whenever it appears, in keeping with a Teatown policy to exert maximum control of this lovely, but licentious plant. 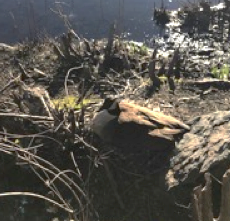 The goose is still nesting, the Skunk Cabbage blooms almost entirely gone. 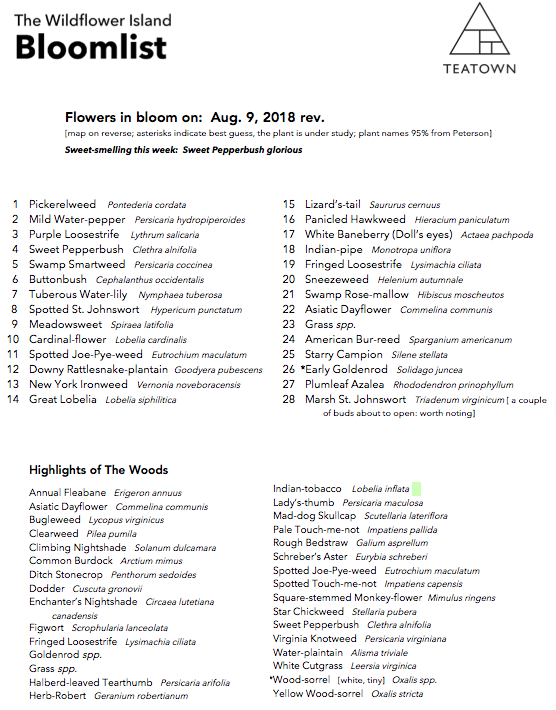 This week's bloomlist for Wildflower Island is at the end of the post. are welcome in the comments section. The new season started today with very few blooms but a couple of really nice surprises. 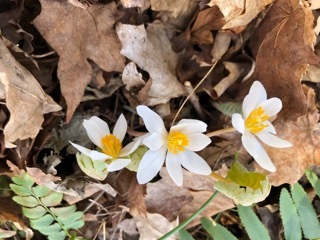 There are some lovely Bloodroot blooms walking down to the Island from the parking lot – go off the stone steps to the right, a little past the area where that big Red Trillium usually sits under the rockface. Also in The Woods, there's a ton of Lesser Celandine around the stream and Waterfall Bridge (see the names of various locations at the end of this email). Strange that on WFI, though, not a single bud in the small patch of Celandine has yet opened…maybe by the weekend. 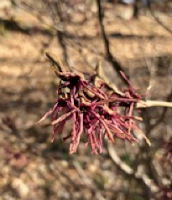 Red Maple florets are on the path in many places, Woods and WFI. The Hybrid Witch-hazel “Diane" (pink) is very much in bloom, and some of the Spicebush shrubs below them on the hill are blooming yellow and smelling great. I suspect more will be open by the weekend. Welcoming us once again to WFI this season was this matron, who apparently does not “leave the nest, eat, drink, or bathe while the eggs are incubating” (28-30 days). She’s on the left at the end of the bridge to the Island. 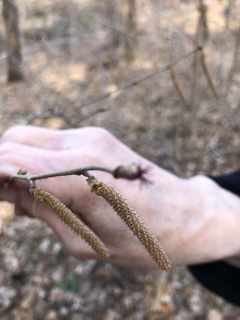 Phyllis and I were able to catch a female bloom next to the male catkins of what I believe is a Hazelnut near the Witch-hazels in The Woods. Ours is the one below left — so difficult to get a picture of it in the wind with smartphone. It’s the first time I’ve seen those red petals (filaments). 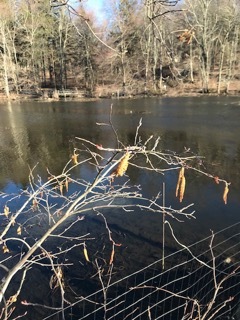 The one below right is a Beaked Hazelnut, Corylus cornuta. Wiki says the Beaked kind "is named from its fruit, which is a nut enclosed in a husk with a tubular extension 2–4 cm long that resembles a beak. 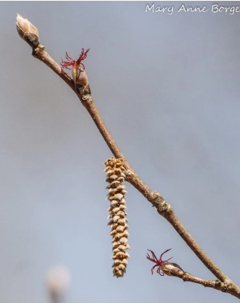 Tiny filaments protrude from the husk and may stick into, and irritate, skin that contacts them.” Maybe that’s what we have here, in which case, we might be able to add Beaked Hazelnut to our species list for The Woods. 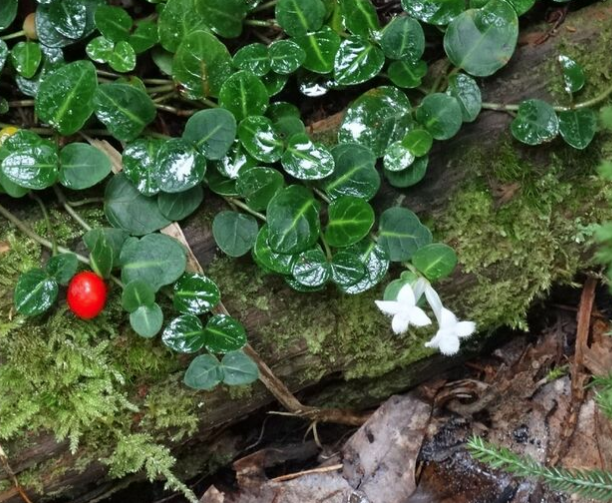 Most delightful of all were the Trailing Arbutus blooms, stretching along a very small ridge in their normal place on the Island for about two feet. So sweet. I did not see any Mottled Wild Ginger. I found something interesting in the shrub book in the gatehouse, which I’ve left open for y'all on the counter. 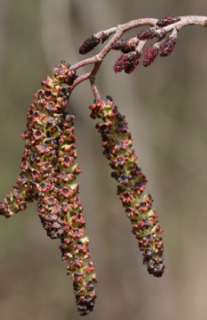 The female flowers of the Smooth Alder apparently extend outward or upward from the branch (see left), while those of the Speckled Alder droop downwards (right). But the two kinds of Alders grow near each other and hybridize, so this is not foolproof — only interesting. 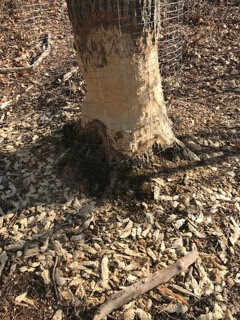 Here’s what a beaver did to a large tree on the northern path of WFI before you get to the Bayberry. 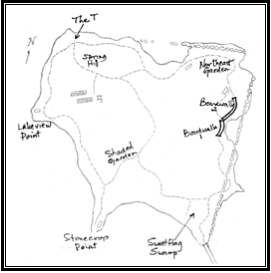 Link in the sidebar for a reminder of the names I gave parts of the island and Woods last year to make it easier to pinpoint where something was seen. 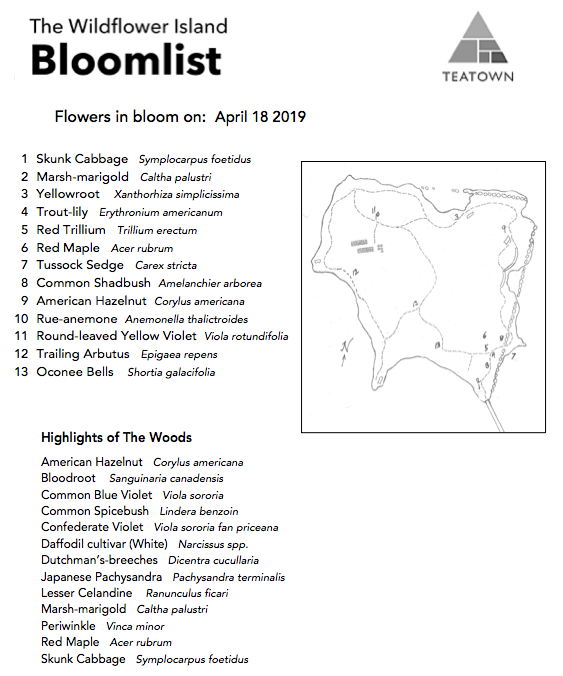 This week's bloomlist for Wildflower Island at the end of the post, and Bonnie's pictures here. Peterson names used for consistency wherever possible. Comments and clarifications welcome in the comments section. 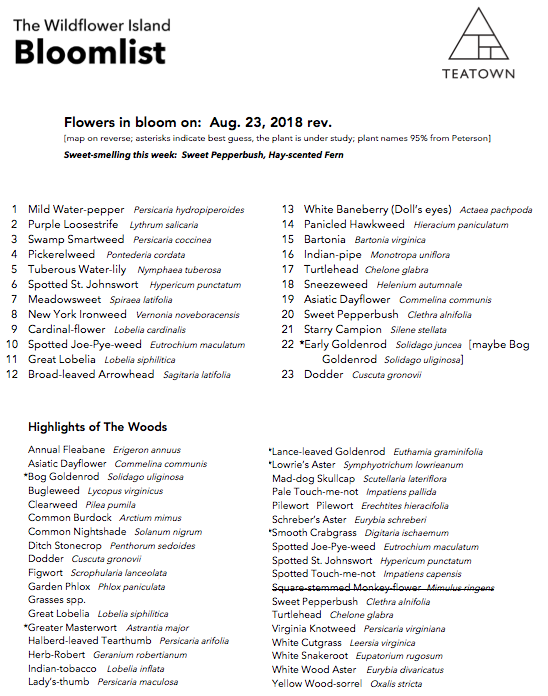 This is the last bloomlist of the season, so we’re saying good-bye to all our floral friends while they get some rest. So many of the summer stalwarts are now gone for the year – Annual Fleabane, Spotted St. Johnswort, Tuberous Water-lily, Cardinal-flower, and Asiatic Dayflower – and just about gone are the Yellow Wood-sorrel, Herb-Robert and NY Ironweed. 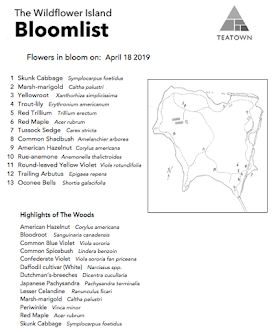 But to see the Masterwort bloom again (Greater or Lesser, don’t know) in The Woods at the bottom of the Rock Steps was really surprising, and there was a beautiful array of White Wood Aster at the gatehouse side of Spruce Oval. The Orpine on the Island is blooming like I’ve never seen it before, and the Bicknell’s Cranesbill is popping up in many places. We’re used to only seeing one of these at a time. The False Dragonhead (commonly called Obedient flower, but I’m using the Peterson names for consistency) opened for us just in time to say good-bye for the year. Thank you, thank you. 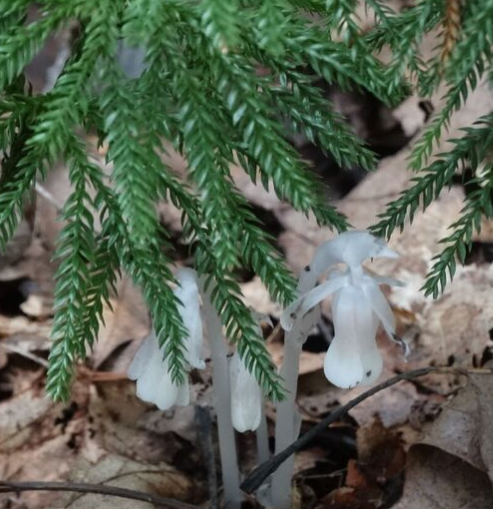 The same white-on-green shows up in Bonnie’s picture of Indian-pipe, against a background of Lycopodium. Reminds me of Christmas. 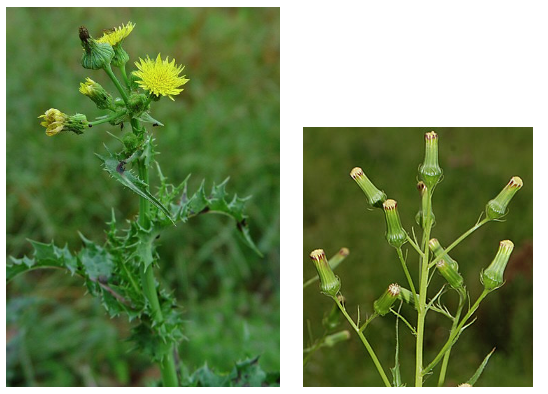 Notably missing this whole season in The Woods has been the Spiny-leaved Sow-thistle (below left; we never saw any of it) and Pilewort (below right; very few), which leads me to believe Teatown is pruning them out. Also defeated by the Goldenrods, which we can’t I.D. exactly. If anyone would like to take that project on, be our guest. Check out the Pachysandra just as you come into The Woods from the parking lot. Why does it look as if it’s in bud and about to bloom? No sign of beavers. We are all kind of wondering if they’ve moved on to other waters. 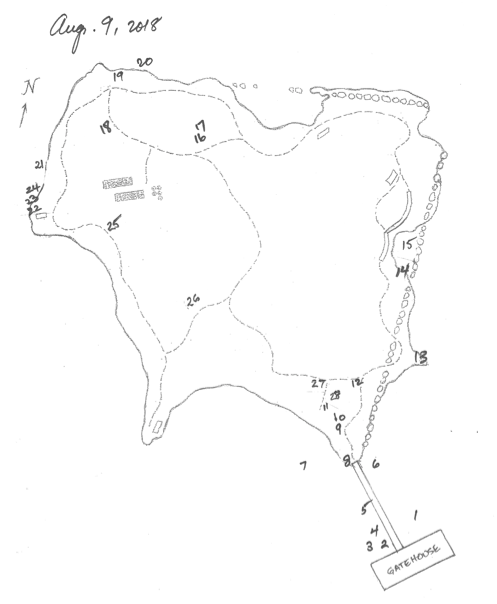 Note: On the bridge to the Island, I forgot to look for the *Straw-colored Flatsedge that might have been across from #5 on today’s list, on the left side of the bridge looking straight down. Oops. Comments and clarifications welcome in the comments section. Sept. 6th revisions in red. 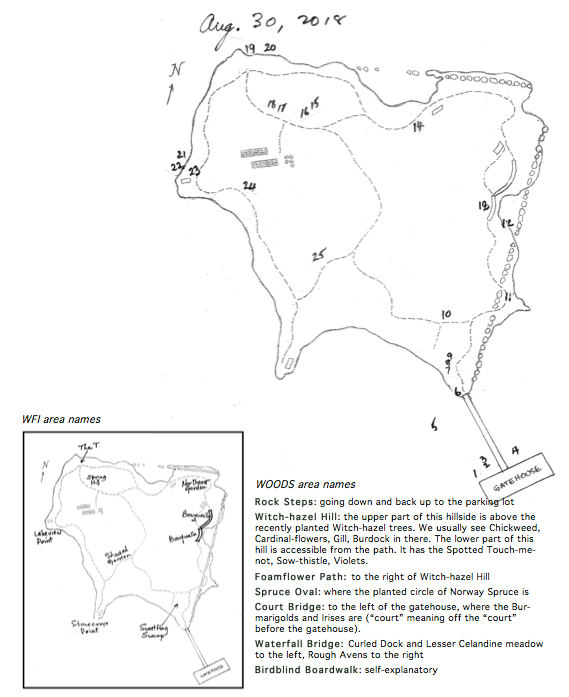 On the Island, be careful not to step on the Bicknell’s Cranesbill, which is in the middle of the path at no.10. 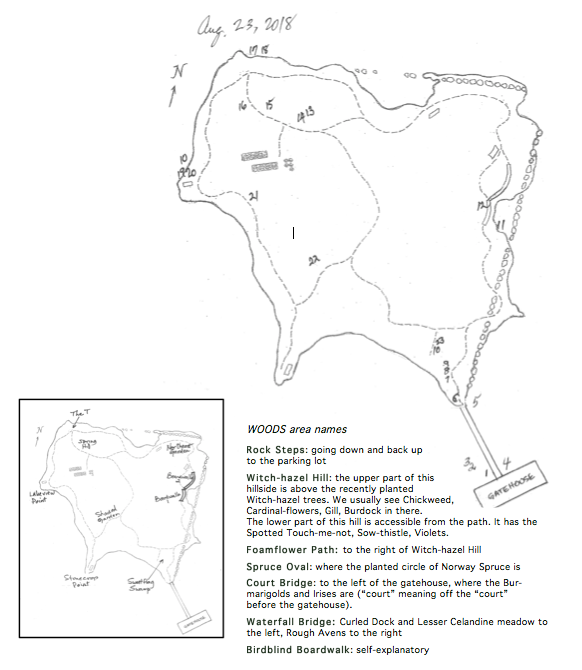 Also, near the Bayberry (on Lakeview Point; see map right) is a very young evergreen we hadn’t noticed before. Mat thinks it’s a Red Cedar. I’m having trouble identifying a couple of things. 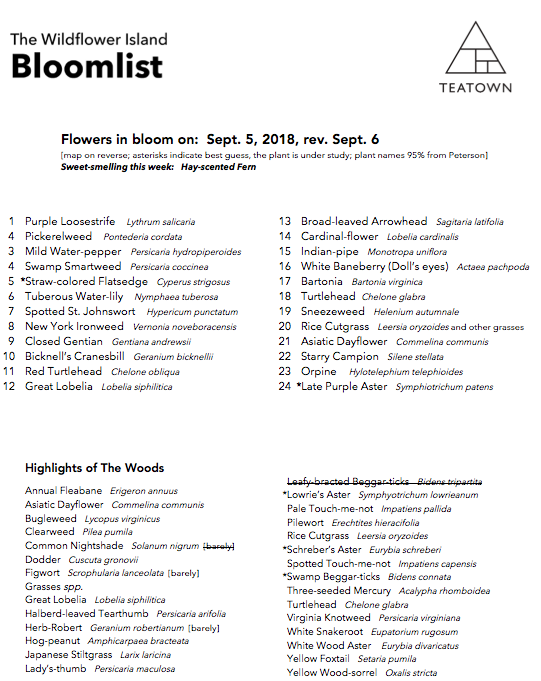 Last year I did some research on some late-blooming plants, which I should have looked at before doing the list today. And there is talk on the internet of it being a more southern plant. 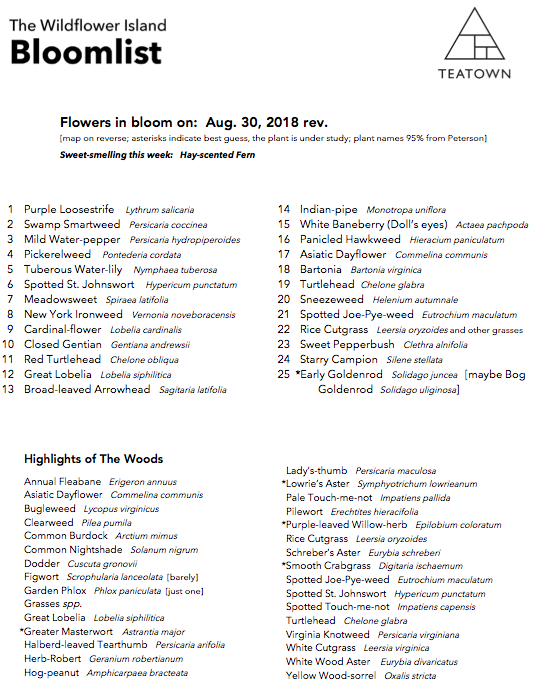 On WFI, there’s a single blue-violet bloom – 3 blooms on Sept. 6, and more than one plant – on something I’m guessing is a Late Purple Aster Symphiotrichum patens. It’s one of several asters in Peterson’s blue pages whose leaves clasp the stem (p. 356). I am not alone in being hesitant to I.D. this aster. 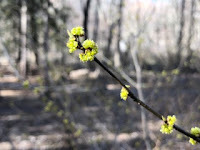 On the Wildflowers of the United States page, the botanist writes: “It is with some trepidation that I step into the arena of identifying Symphiotrichum species.” Each bloom is at the end of thin, wiry stalk, and the main stem is rough. Though Symphyotrichum is generally regarded as an extremely difficult genus, the vast majority of New England collections are straightforward to assign to species. 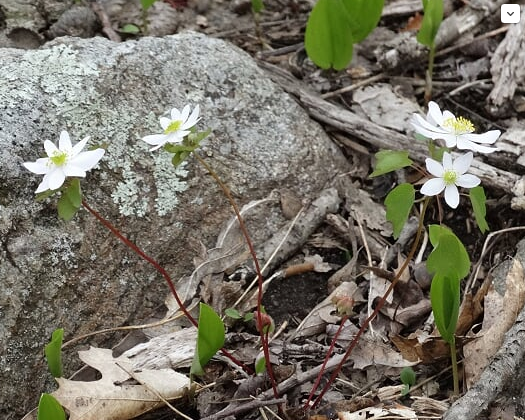 Once learning the large number of taxa is overcome, infrequent hybridization and rare aberrant forms are some of the few stumbling blocks that botanists will face here in New England. 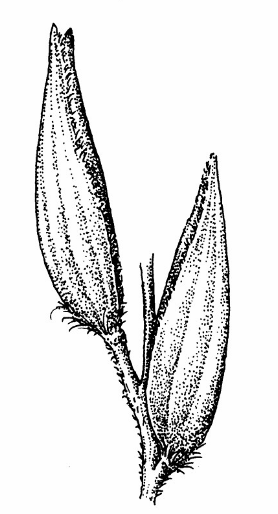 Identification necessitates familiarity with details of the involucral bracts and disk flowers….. 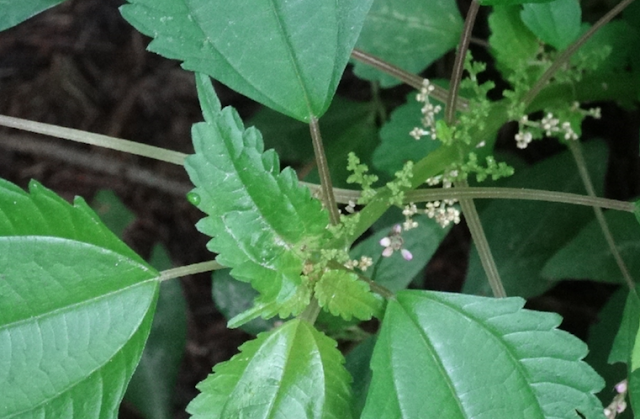 Surprising this week in The Woods are the prolific Touch-me-nots, both kinds (Spotted and Pale), not to mention the flourishing Turtlehead (white) over by the Court Bridge. 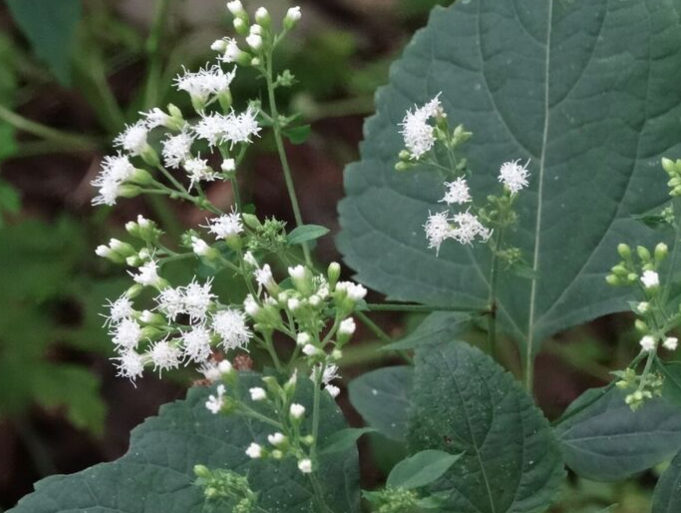 The Snakeroot finally opened, and I expect the place will be covered with its white umbrels within the week. It’s too hard to reach a couple of water plants that I’d like to look closer at, one of which are the Beggar-ticks. I think off the Court Bridge is a Leafy-bracted Bidens tripartita (called B. comosa in Peterson), but could be Swamp Beggar-ticks Bidens connata. In fact, on Sept. 14th, I changed my mind and now think it’s the B. connata. Another problem: Asters. I believe we have these three, but am still not sure, even after all these years. I took some more time to study these on Sept. 6th and am more convinced that we’ve been correct on these three varieties. In any case, now is the time to study them, as many patches of them are in full bloom. PS: I am not counting out hybridizing, but when you look at a lot of them, there seems to be distinct characteristics. White Wood Aster Eurybia divaricata: strongly heart-shaped leaves with large coarse teeth. Clusters flat-topped, flowers with relatively few rays. (Peterson, p. 94). Lowrie’s Aster Symphyotrichum lowrieanum: Peterson says the flanged (winged) stems are distinctive, but GoBotany says Lowrie’s haven’t been seen in New England “for many years.” There is a large patch of these where the path forks just before the gatehouse. Schreber’s Aster Eurybia schreberi: Basal leaves large and heart-shaped, with broad angular notches, best illustrated here in Wiki (below left), GoBotany (middle) and Delaware Wildflowers (right). There are some good examples of this deep notching and angulation: check along the edges of the paths around Spruce Oval. Ours, instead, looks more like the one they show here. I forgot to check whether the Willow-herb was still blooming, but the Japanese Stiltgrass Microstegium vimineum has bloomed this week. 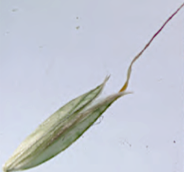 Its spikelets come in pairs, each little floret with an awn. 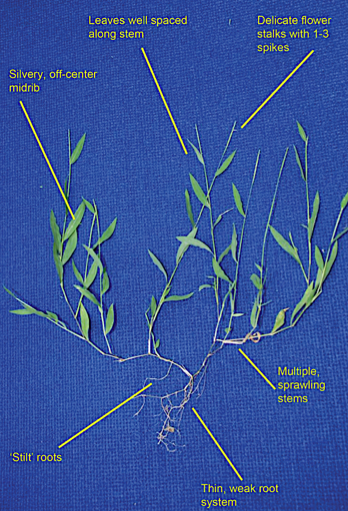 An excellent .pdf on this grass and its look-alikes is published by the Alabama Cooperative Extension System. The Orpine Hylotelephium telephioides was in bud, some ready to open, but I am not putting it, since when it opens, it’s really a noticeable flower (below left, photo from the net by Michael Huft). None of the buds were open today. 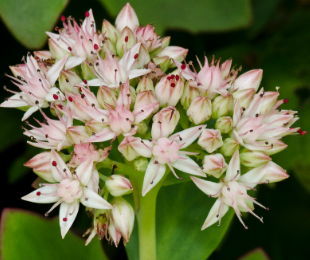 By the way, Peterson calls it Sedum telephium, but there’s consensus about the Hylotelephium Latin name. Bartonia (right): I am including this in the bloomlist because after looking closely at it to see whether it was flowering or gone to seed and finding this picture on internet, decided what we had today were some florets, and some gone to seed. 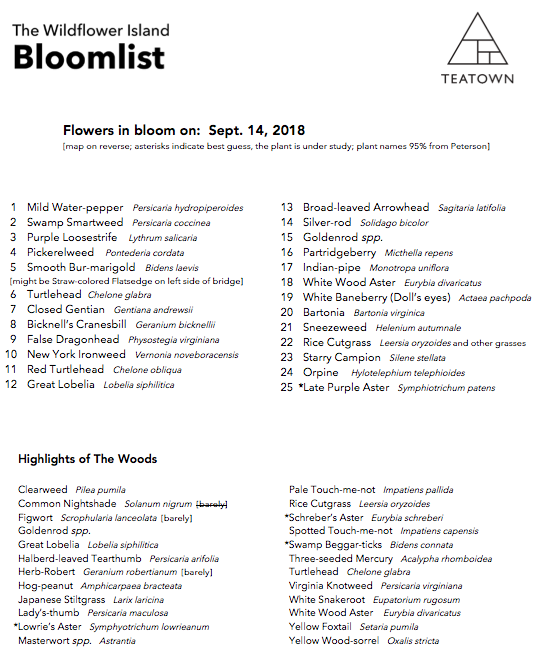 It’s difficult to know whether to include a plant in the bloomlist when most has gone to seed and only a few “bloomlets” (hardly the right word) are left. Mostly we decide on the spot whether to include one of these sparsely flowered plants or not, but this week Bonnie did the pictures on Wednesday and I was there today. Bonnie was able to capture a couple of these remaining bloomlets in her pictures, but I missed them altogether and did not include them. It’s possible that what she saw yesterday were gone by today. You might want to keep a look-out for any remaining Indian-tobacco and Rough Bedstraw. 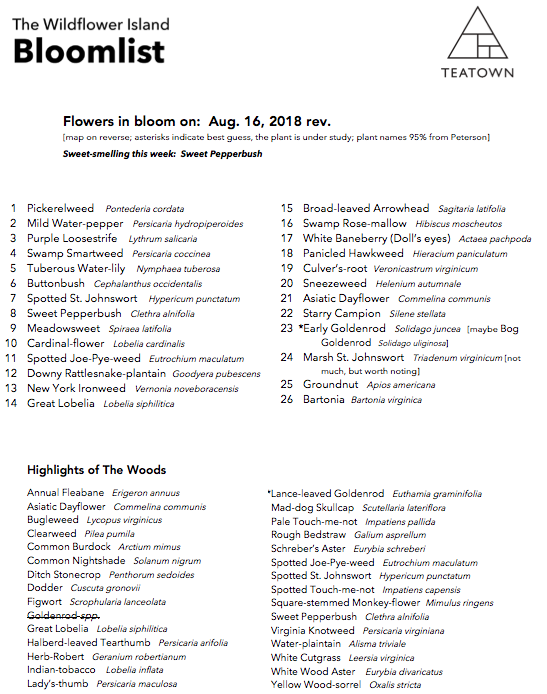 We might have missed Pilewort Erechtites hieracifolia in The Woods last week, because I saw a 4-foot specimen of it today. 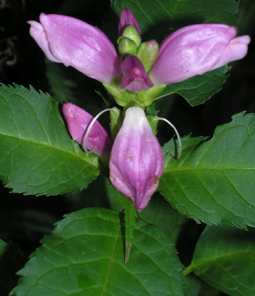 In a former year, I referred to one of the Willow-herbs as “Narrow-leaved Willow-herb,” and I don’t know if that was a mistake. Today’s I think is “Purple-leaved Willow-herb,” Epilobium coloraturum, because of the sharply toothed leaves. It likes wet ground. Peterson says: “Note the distinctly toothed leaves” with seedpods “stiffly ascending.” That’s ours. Hog-peanut is finally blooming (in The Woods). Peterson gives the Latin name Amphicarpa bracteata, but USDA and many others say Amphicarpaea. 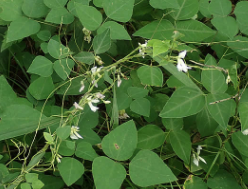 A small amount of Common Nightshade has been growing on the left of that same path for several years. Today we noticed it spread to the other side of the path as well. And talking about Bonnie’s great pictures, check out the detail on this Clearweed. These flowers are really, really tiny. Also in The Woods, looking uphill from the Waterfall Bridge, is a single Garden Phlox plant (Phlox paniculata), which Mat and Laurie think might have floated in from a plant sale from the parking lot (LOL). I’ve added to the species list, because we never had it before. You won’t see it up close unless you climb into the wetness in that whole area. 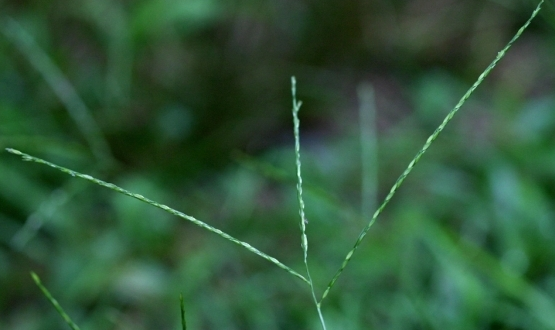 This below is Crabgrass, which is blooming along some of the paths in The Woods. (Note: I had it originally as Hairy Crabgrass, but now on Aug. 30th, I'm thinking it might have been Smooth Crabgrass Digitaria ischaemum. The White Cutgrass (Leersia virginica) has also started to bloom. The seeds are NOT in pairs, and are somewhat rectangular (below left). 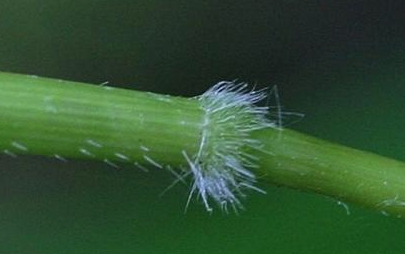 The hairiness around the nodes (below right) is another thing that differentiates it from Japanese Stiltgrass, which is not blooming yet. Bloomlist below, Bonnie’s pictures here. There are no notes for today. The list was prepared by others. This is a great week for mushrooms,so we took as many pictures of them as possible and carved them out into their own folder at this link. 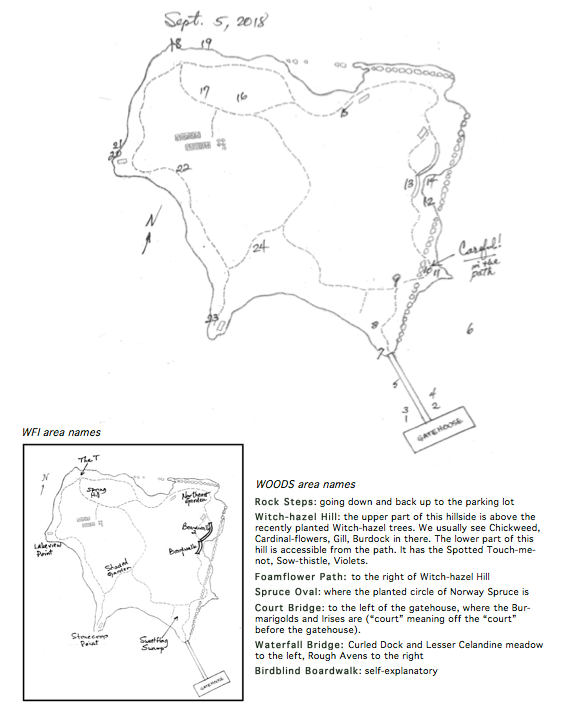 I’d like to name some of the places on the Island and in The Woods because it will be easier to refer to them. 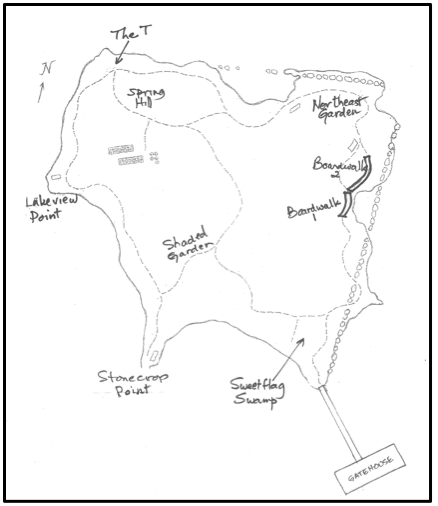 Sweetflag Swamp: at the beginning of WFI, even though the Sweetflag itself is only visible at the end of the walk, from the other side. Boardwalk 2: Mottled Wild Ginger is at the end of this one. Northeast Garden: this is where we always see Starflowers, Creeping Phlox, Lobelias, and Maidenhair Fern. Spring Hill: the rocky bit where the Dwarf Crested Irises, Wintergreen and Fire Pink live. I believe we’ve been calling it Spring Hill already, but let me know if it has been called something else. 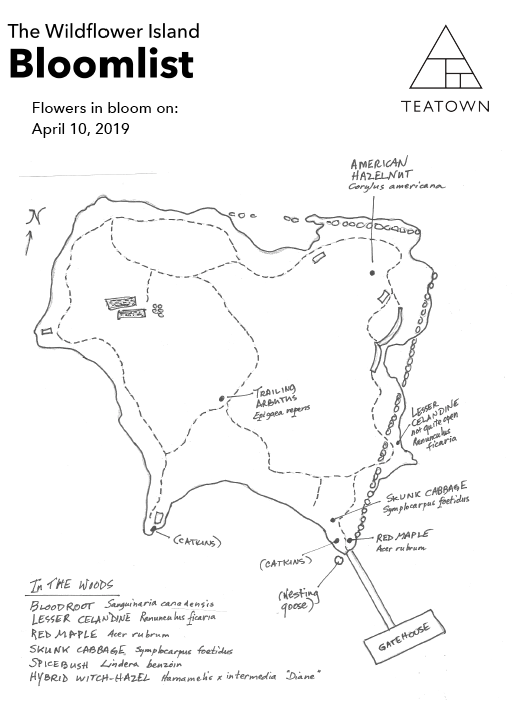 The T: where the Creeping Buttercup and Sneezeweed are. Lakeview Point: where you can see the expanse of Teatown Lake. Shaded Garden: the flower bed where the Tiger Lilies used to be. We may have called it the Garden or the Meadow in the past, but it’s too shaded now. Witch-hazel Hill: the upper part of this hillside is above the recently planted Witch-hazel trees. We usually see Chickweed, Cardinal-flowers, Gill, Burdock in there. The lower part of this hill is accessible from the path. It has the Spotted Touch-me-not, Sow-thistle, Violets. Court Bridge: to the left of the gatehouse, where the Bur-marigolds and Irises are (“court” meaning off the “court” before the gatehouse). I’m open to other suggestions. 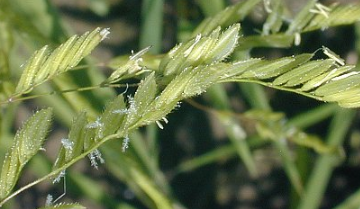 The Cutgrass (Leersia virginica, on the left below) is so similar to the Stiltgrass (Microstegium vimineum, on the right), but the Cutgrass doesn't have the paired spikelets that the Stiltgrass has. The Stiltgrass won’t bloom for another couple of weeks. We saw two swans today, which is such a relief because we missed them for the past two weeks. You can join his mailing list at rickbunting@roadsidenaturalist.com.